Apricot Ale – All Grain Recipe | Kodiak Brewing: Beer, Wine, Cider, Mead Blog. 03/10/2018 / Today we brewed this recipe again, 11 gallons..
bittering – start of boil 1 ounce of pellet hops and 2 ounce of whole Cascade were used. aroma/flavor – At end of 10 minutes we added 2 ounces of Saaz and 1/2 ounce of Fuggle. White Labs California Ale Yeast was used this year. At day 3 of fermentation, the puree from the canned apricots will be added to the fermentor. OG 1.050 / because we brewed 1 extra gallon, 11 vs. 10 and used same amount of grain. Yeast, since we maintain our own yeasts, we use that, saves a lot of money and we have great results, Wyeast 1056 was used. 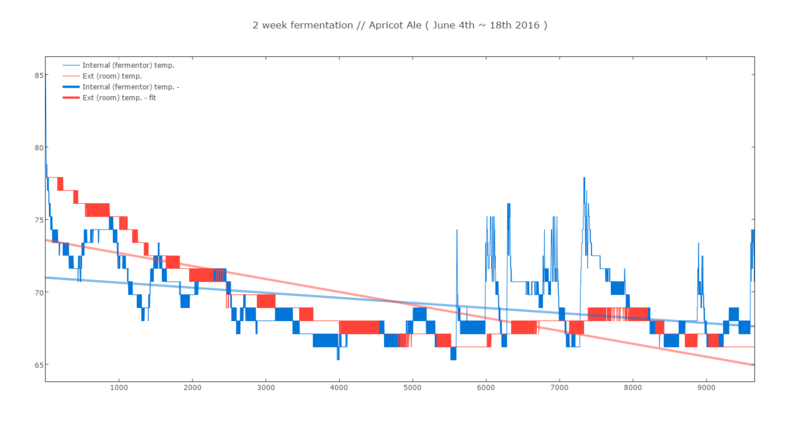 OG 1.056 // on day 3 we added 5 cans of apricots, this for sure raised the sugar levels, but we haven’t figured out exactly how to measure that, fruit calculators do exist, but I am not sure how accurate that really is.. Fermentation was for 2 weeks, below is a 2 week fermentation plot derived from the logger and their respective fit lines. You can see a nice spike when the fruit was added to the fermentor (blue lines are internal temps, orange external [outside the fermentor]). without factoring in the fruit added on day 3, final ABV 6.3% // which probably is closer to 8% 😉 when you do factor in the fruit. 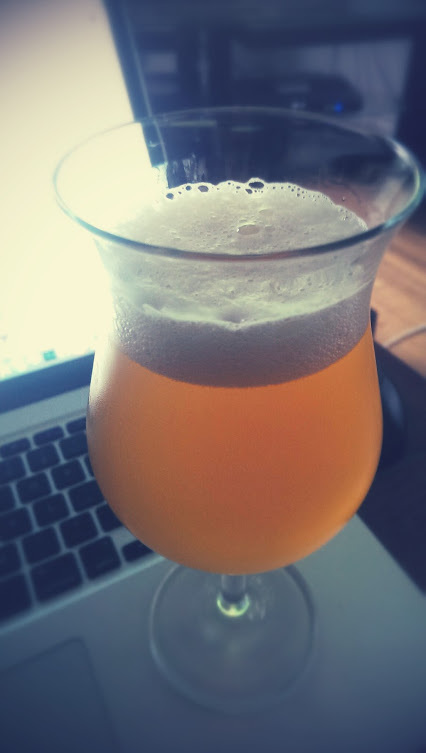 This recipe is fairly easy and the finished beer is delicious! The ABV % will range between 4 % ~ 6 % depending on how much fruit you use and what kind and the efficiency of your brew setup and the attenuation of your yeast. We only used 2 LB of Apricots and later 4 ounces of a natural Apricot flavoring – which will most likely push the ABV up a little bit too once it is finished aging. 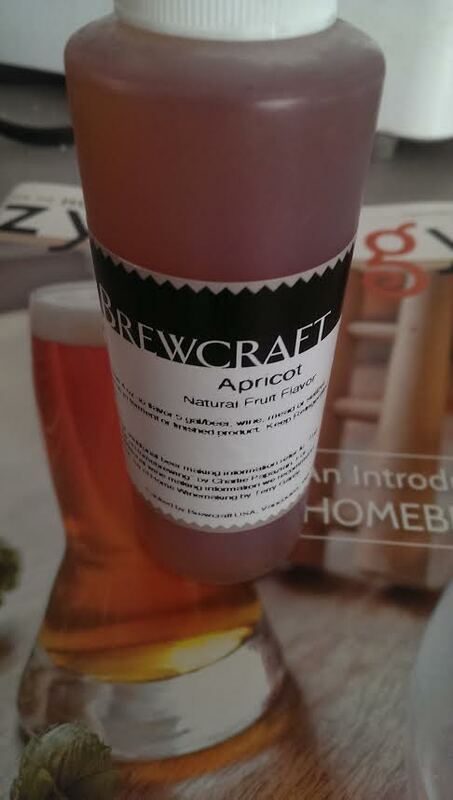 Normally recipe calls for 1 to 1.5 lbs of apricot fruit per each gallon of beer. – The resultant aroma is of medium strength and very distinct. It has a pleasant, flowery and spicy, citrus-like quality with a slight grapefruit characteristic. 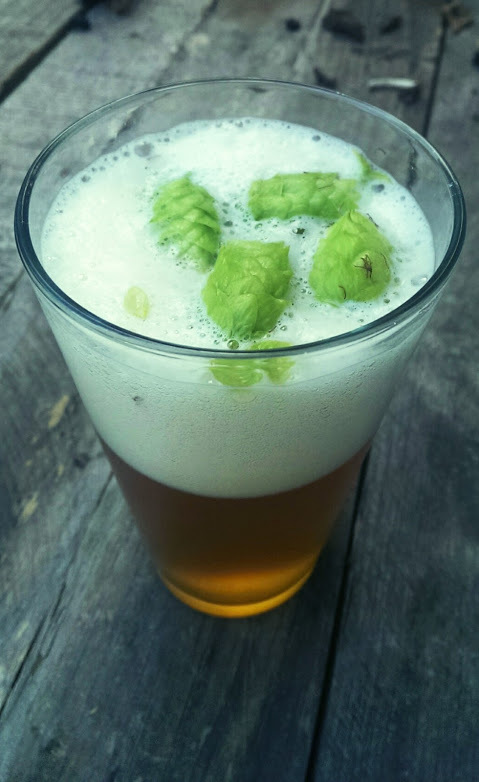 The hop is good for both flavor and aroma uses. It can also be used for bittering effectively, and can be used to make any ales. 2~3 lb of Canned Fruit Puree – add this to the Primary fermentation at day 3 of the fermentation. You can also add some apricot flavorings (you can buy those at the brew store), but add this at the kegging or bottling time. Wyeast American 1056 – we always do a starter! This entry was posted in BEER Recipes and tagged Apricot Ale All Grain Recipe. Bookmark the permalink.